Chris Evans Covers Details May 2012. 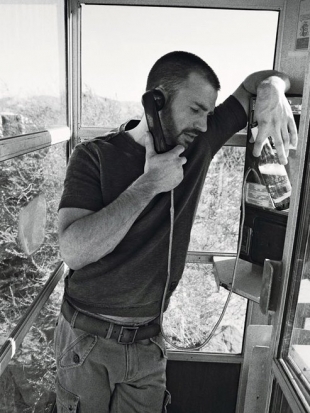 Chris Evans covers Details May 2012 and talks about his career, auditioning, the egoic mind, Eastern philosophy and Boston girls. Check out these highlights from his interview! 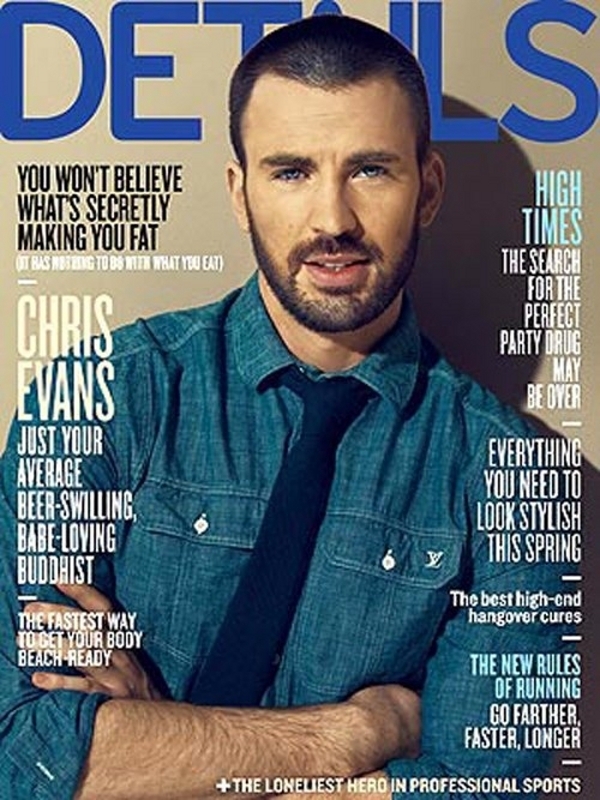 Chris Evans covers Details May 2012. The 30-year-old actor sits down for a chat with the magazine and dishes on a wide range of topics including panic attacks and his hesitation at signing on for Captain America. "I get very nervous," Evans explains. "I s**t the bed if I have to present something on stage or if I'm doing press. Because it's just you," Evans says. On auditioning, The Avengers actor confesses that, "Do you know how badly I audition? Fifty percent of the time I have to walk out of the room. I'm naturally very pale, so I turn red and sweat. And I have to literally walk out. Sometimes mid-audition. You start having these conversations in your brain. 'Chris, don't do this. Chris, take it easy. You're just sitting in a room with a person saying some words, this isn't life. And you're letting this affect you? Shame on you.'" Evans recalls one on-set panic attack while he was shooting Puncture. "We were getting ready to do a court scene in front of a bunch of people, and I don't know what happened," he says. "It's just your brain playing games with you. 'Hey, you know how we sometimes freak out? What if we did it right now?'" At 17, Evans came across a copy of Hermann Hesse's Siddhartha and it was then when his spiritual search began. The actor says that this is a path of study and struggle that defines his true purpose in life. "I love acting. It's my playground, it lets me explore. But my happiness in this world, my level of peace, is never going to be dictated by acting," he told Details. "My goal in life is to detach from the egoic mind. Do you know anything about Eastern philosophy?" He then continues explaining that, "They talk about the egoic mind, the part of you that's self-aware, the watcher, the person you think is driving this machine. And that separation from self and mind is the root of suffering. There are ways of retraining the way you think. This isn't really supported in Western society, which is focused on 'Go get it, earn it, win it, marry it.'" Evans also says that, "I think my daytime person is different than my nighttime person. With my high-school buddies, we drink beer and talk sports and it's great. The kids in my Buddhism class in L.A., they're wildly intelligent, and I love being around them, but they're not talking about the Celtics. And that's part of me. It's a strange dichotomy. I don't mind being a certain way with some people and having this other piece of me that's just for me." Arguing about egoic brains and the tao of Boston girls, Evans says in the interview with Details magazine that, "I love wet hair and sweatpants. I like sneakers and ponytails. I like girls who aren't so la-di-da. L.A. is so la-di-da. I like Boston girls who s**t on me. Not literally. Girls who give me a hard time, bust my chops a little," he says.